Piqua, Ohio, March 17, 2015 – Hartzell Propeller Inc. has appointed American Propeller Service as a Recommended Service Facility. American Propeller, of Redding, Calif., covers a large area of the western United States with its fleet of transport vehicles offering propeller pickup and delivery services. “American Propeller is elated about its new status as a Hartzell Propeller Recommended Service Facility,” said Ameritech President Kerry Dawes. “By teaming with Hartzell Propeller we are bettering American Propeller and the services it can provide through utilizing Hartzell’s excellent training programs,” he added. The addition of American Propeller represents a continuation of Hartzell Propeller’s commitment to grow facilities around the globe capable of meeting Hartzell’s rigorous standards for customer service. In many cases, Hartzell Propeller requirements significantly exceed those of the governing airworthiness authorities. The company encourages customers to use a Hartzell Recommended Service Facility for propeller repairs and overhauls. As a member of the network, American Propeller provides the highest-quality propeller overhaul and repair work available, reflecting Hartzell’s customer commitment to quality and performance. American Propeller becomes the 22nd Hartzell Propeller Recommended Service Facility. It joins a network of Hartzell Recommended Service Facilities located throughout the Americas, Europe, New Zealand, Australia and Malaysia. This group of affiliated facilities, with factory trained technicians and state of the art equipment, ensures that owners and operators of Hartzell propellers are only a short flight, or drive, away from the best Hartzell recommended propeller service in the industry. To achieve Hartzell’s Recommended Service Facility designation, American Propeller met a number of stringent requirements, including on-site quality systems and process audits and use of factory trained and highly qualified propeller experts. In addition, the new Recommended Service Facility is required to maintain Hartzell-approved specialized propeller tools and equipment along with meeting the company’s special process approvals on an ongoing basis. American Propeller also supports Hartzell customers as a Warranty Center. Partnering closely with the Hartzell factory, American Propeller receives preferred technical and parts support on warranty issues. This relationship ensures that Hartzell customers receive the highest-quality warranty repair work, processed and completed in the shortest possible time. American Propeller Service, established in 1976, is an FAA approved repair station that offers complete propeller servicing. Capabilities include propeller overhauls, repairs, new propeller sales and STC upgrades, along with governor overhauls, exchanges and new sales. American Propeller also has a unique pick-up and delivery system that allows it to cover the western United States. For more information go to: Ameritech-aviation.com. Hartzell Propeller is the global leader in advanced technology propeller design and manufacturing with over 3,800 propellers delivered annually to business, commercial and government customers. The company designs these next generation propellers with innovative “blended airfoil” technology and manufactures them with revolutionary machining centers and robotics. With ASC-II™ composite technology, Hartzell delivers optimal performance, strength, and durability with carbon fiber blades. 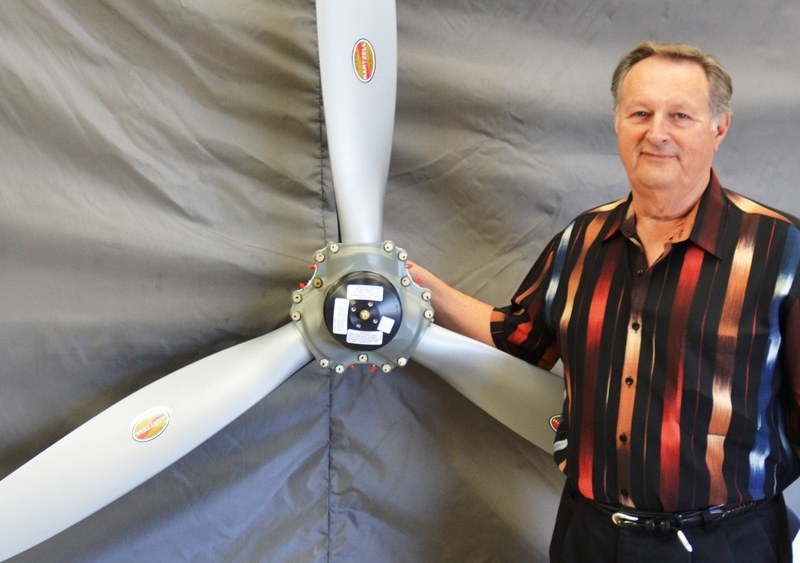 Hartzell Propeller and its sister company, Hartzell Engine Technologies LLC, form the general aviation business unit of Tailwind Technologies Inc. This growing aerospace technology company also includes Hartzell Aerospace and Mayday Manufacturing. For more info on Hartzell Propeller go to hartzellprop.com.